Welcome to my Screenshot Let's Play of the new released game for PC and PS4, Younder: The Cloud Catcher Chronicles. I confess, I did do a bit of playing with out you....I was really excited and needed to get it out of my system! I tried to as closely match my real self as possible. I think I am re-reading a letter that must have been left with me as a small child. Oh, my poor parents. I wonder if I will get to see them again? Ooo.....shiny magical compass. Yes, well, the day has come my darling parents! I will set out now to find my destiny. This sounds like a very long journey, I must say. I think I will manage. Home? I'm headed home. Wonder if anyone will know who I am? *Gasp* I'm already on a boat! Looks like I am well on my way there. Look at those lovely sails. Did I help make this boat? The water is so calm and lovely. How could anything possibly go wrong! This. is. an. adorable. boat. Look at my lantern! Ah, this is so peaceful. Ah, Jib. Our delightful cook. I hope you were hired for your position based on your talent and not on your gender. Also, isn't it called a galley? Maybe that's just where we eat? Yes, good man Luff! Get us ready to land! How exciting! Do you have a man bun? I think you do. I wonder that as well, Tack. Also, I must say I think we've been on this boat too long as I find you quite striking. Are you a marriage candidate? Oh, wrong game. Well, if that changes, let me know. What's our status Captain? I hope that's the only thing behind the fog! Everyone makes such a big deal out of my magical compass. Maybe, I'm not dead.....Captain? Tack? Luff? Jib? Anybody? Hello? Sigh. I guess I will explore this cave. Oh, look a stone. That might be handy. I guess I'll put that in my backpack...which I might add is way larger on the inside than it looks. What's this blue sparkly thing? AHHHHHHH!!!!!! What the heck are you?!? Awww.....well, I don't want to be alone anymore either. So, sure, come along. Yes, let us see how heavy we can make my backpack. I think this stone is larger than my backpack. But it fits, with plenty of room to spare. I must have a magical bag to match my magical compass. There was some mysterious and sinister looking purple shadowiness blocking our passage out. Thankfully, Lumie was able to clear it. Apparently, Sprites are magically talented in this way. It exhausted poor Lumie. Lumie explained that if we found his lost brother and sister sprites they could clear the patches of "murk" as he called it more easily. Alright then Lumie, priority one: find more sprites. Lumie is telling me that we need to get some help in Fairmont. Sigh...it's true...my clothes are tattered, I'm thirsty, and I can't remember last time I ate. I could sure use some of Jib's cooking right now.....And night is falling and I need a place to sleep. By the time I approach the town, it's already well past nightfall. 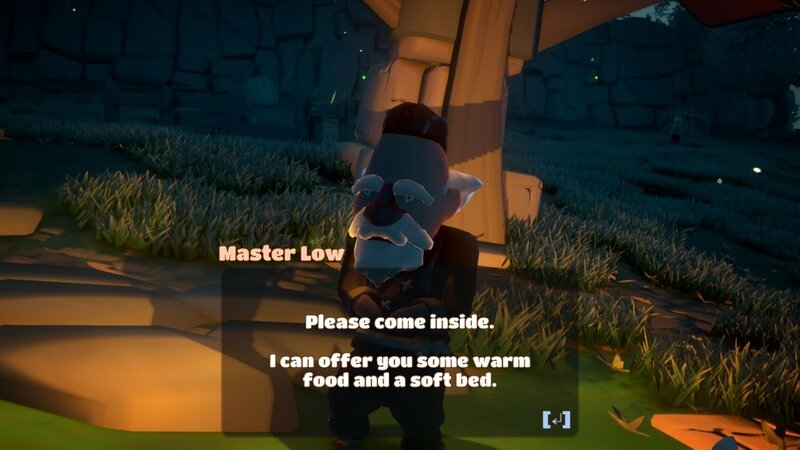 Still, a very friendly man named Master Low gives me food and shelter for the evening. He also gives me clothes, and the names of a few people who might be interested in helping me further. I am so grateful. Thanks for reading Day 1! If you enjoyed this and want to see Day 2 be sure to comment and let me know!